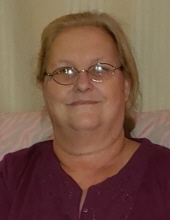 Shelly Marie Merritt, 57, of Saegertown, passed away Friday, January 25, 2019, at home. Shelly was born in Meadville, on November 18, 1961, a daughter of the late Frank "Bill" and Beverly (Wood) Leonhart. She had married Robert Allen Merritt on April 14, 1980. Over the years Shelly was employed as a cook at various local restaurants and pubs including Valenta's, Mac's and Red Lobster. She attended Townville and Maplewood schools. Shelly was an animal lover and especially loved her dogs. She liked to crochet and would often give her handmade blankets as gifts. Her other hobbies including fishing, playing BINGO and in her younger years, she enjoyed hunting. Her greatest joy in life was spending time with her grandchildren. Shelly is survived by three sons Jason M. Leonhart (Pamela) of Spartansburg, Robert A. Merritt Jr. of Saegertown, Jacob Leonhart of Townville, ten grandchildren, three great grandchildren, a sister Crystal Terrell (Dennis), a brother Michael Leonhart, both of Townville, and her former husband Robert Merritt of Saegertown. In addition to her parents, Shelly was preceded in death by a son Ryan Merritt and a brother Richard "Lenny" Leonhart. A Celebration of Life Service will be held at a future date which will be announced on social media. In lieu of flowers, memorial may be made in Shelly's memory to Stephen P. Mizner Funeral Home & Cremation Services, Inc., 404 Chestnut St., Meadville, PA 16335. To send flowers or a remembrance gift to the family of Shelly Marie Merritt, please visit our Tribute Store. A Celebration of Life Service will be held at a future date which will be announced. "Email Address" would like to share the life celebration of Shelly Marie Merritt. Click on the "link" to go to share a favorite memory or leave a condolence message for the family.